Several months back I went on a little thrifting spree and picked up lots of little things to refinish/repurpose. 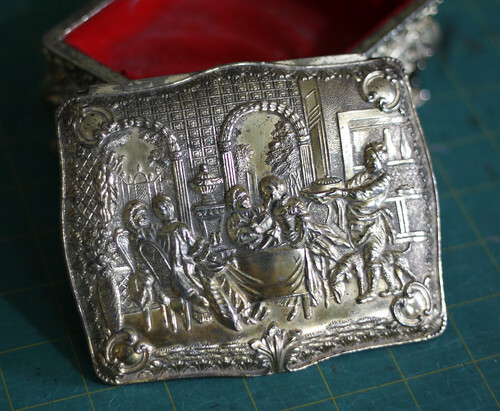 One of those things was a cracked little metal jewelry box with a broken lid (for $1.00). I think I remember having one just like it when I was a little girl. 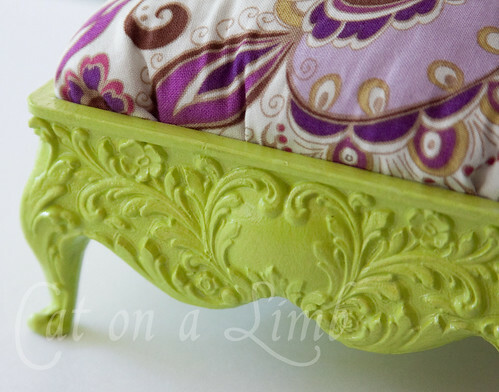 I quickly fell in love with the tiny Queen Anne style legs and swirly flourishes on the sides. I didn't care for the lid, and it was half dented anyway. Luckily it was broken clean off with no jagged edges, so I just discarded it. 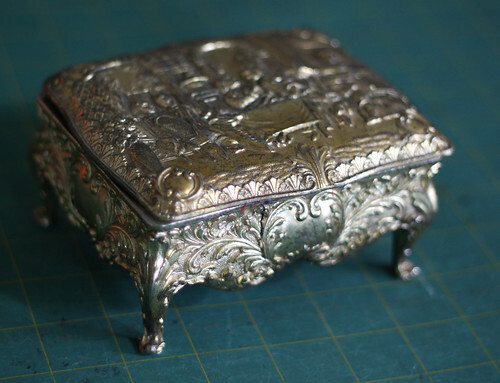 At first I was thinking of painting the box and using it as a dish to store quarters for laundry. (Might as well have something that makes you happy every time you reach for more, and more, and more quarters to do laundry, right?) Then I had a different idea. I pulled out the E6000 (for the first time ever, can you believe it? ), glued the crack and clamped it in place overnight. Painted and sealed it, then made a little densely-packed pillow (made with a fat quarter and poly fil) to stuff inside. Not much evidence of the crack! I'll be linking up to these fabulous link parties! Well done - another brilliant transformation. Darling! I featured this at somedaycrafts.blogspot.com. Grab my "featured" button. Such a great idea and it turned out adorable!! This is fabulous!!! I'm a sucker for a cute pincushion transformation! Thanks for the inspiration! I think that's the most beautiful pin cushion I've ever seen! Great before and after! Hi - this is sew cute! What a creative way to re-purpose the jewelry box. I absolutely love your color combo. That reminds me of the coffee cup pin cushion (or is it a pin cushion coffee cup?) I made a few months ago. 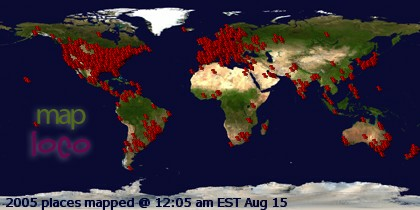 I think it's time to blog about it! :) come over and share a cup of coffee with me at http://altered-artworks.blogspot.com. Looking forward to seeing you there! OMGOSH!!! I WANT TO DO THIS!!! Very cute! I remember my mom having that same box!! I love your pin cushion. What a wonderful treasure turned even better. 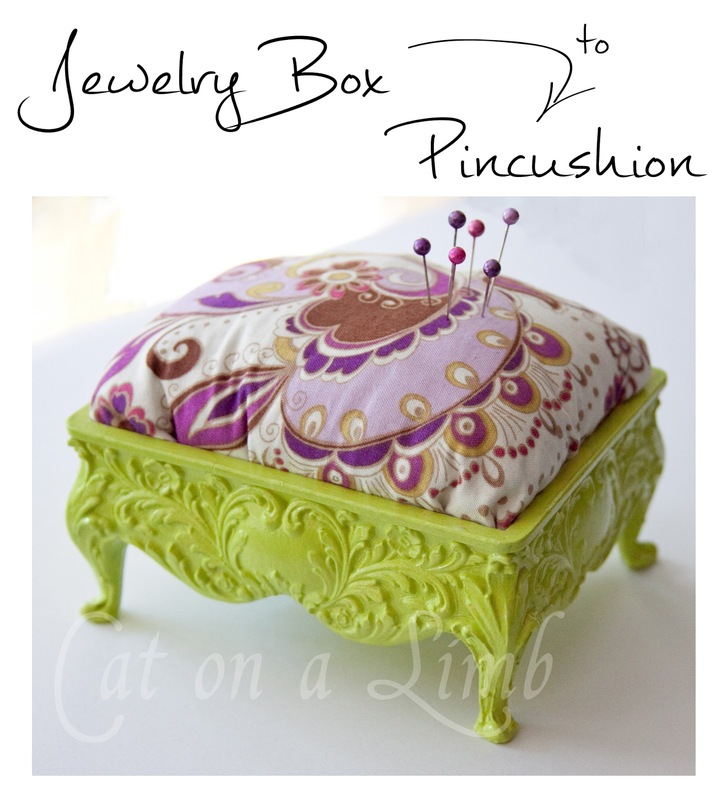 I saw your pin cushion featured on Craft Gossip and had to drop by! 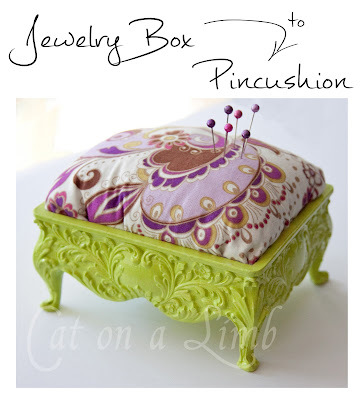 The prettiest pin cushion I have ever seen! I want one! 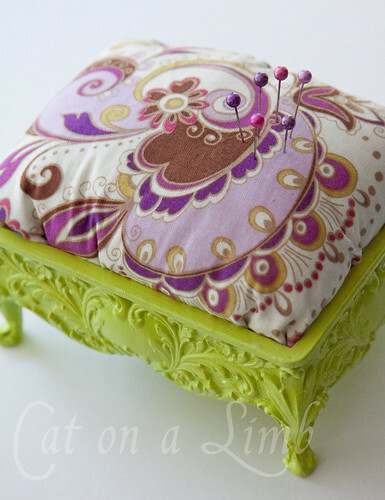 this is adorable, I saw the after photo first and as a photographer i was hoping it was a cute little stool - i was ready to run out and start looking for one in my area - hey i can use a pincushion too, thrift stores here i come! Adorable and pretty, Catherine! I love the colors! This is very cute..i love the idea, you are amazing dear!! Love this project! It turned out so cute! Thanks for sharing. I love how that came out. I should find something that would work for that. Thanks for sharing! This came out amazing....I'd love if you linked up on my Weekend Craft Hop! This is awesome! I love the colors you chose! Definately my favorite pin cushion ever! Oh, that turned out really super! Thanks for visiting my blog and leaving your sweet comment! Really cute! Good Job! Thanks for sharing it with us. Wow beautiful! I think the before is beautiful too but the after is just so adorable. The colors are perfect. I would love it if you would stop by and link this up to the crafty link party going on right now at Lines Across My Face. LOVE this! I totally used to have a gold jewelry box like that!! I love how you repurposed this! Excellent job. The lime green is awesome, too! This is fabulous, Catherine! We are featuring this today and votation also starts today. 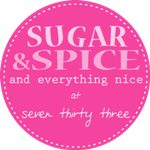 Thanks for linking up this lovely project and we hope to see you again this week at the party. have a lovely weekend. I have the EXACT same little box! I haven't parted with it because I love it's size and shape and was just sure I could figure something out. That was 4 years ago. I am inspired and excited to dig it out of it's drawer and give it a makeover for my brand new studio! 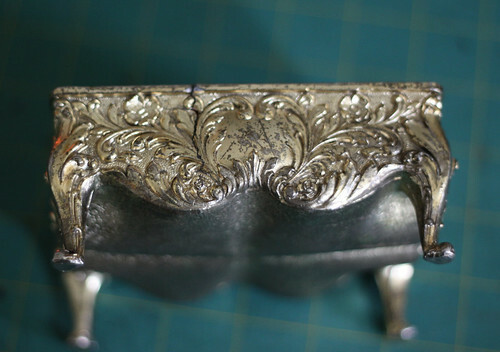 Thanks for sharing another wonderful project!Beautiful work. So I've told you before how much I ADORE you pin cushion!! I completely borrowed this idea to make a pincushion for a friend!! Thanks so much for the inspiration!! 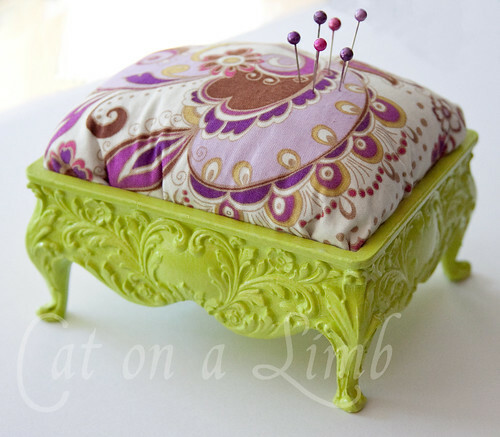 This is one of my favorite pin cushions ever! I love the bright color and fun fabric. I featured it on Fun Friday Finds today. This is an awesome design - I have a similar box which is heart shaped for which the top has broken off but it's too nice to throw away, certainly doing to try this out and find a new use for it!